If you happen to pay attention to things like buzz and hype when it comes to tattoos and the tattoo “scene”, then you probably already know that literary tattoos are now being touted as a current and rapidly rising tattoo trend. I personally hate the concept of trends and I have literary tattoos (done long ago, fyi), so the idea of having my tattoos confused with any sort of hot new trend doesn’t particularly excite me. 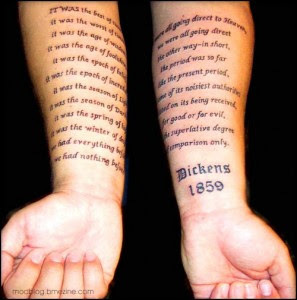 Regardless, I still like seeing literary tattoos and they do interest me a great deal. Perhaps literary tattoos interest you as well. If that’s the case, then you might want to buy, borrow or just kind of casually leaf through your local bookstore’s copy of the new book out on October 11th from Harper Perrenial called The Word Made Flesh: Literary Tattoos from Bookworms Worldwide. The Word Made Flesh is a coffee table book (sadly it doesn’t actually turn into a coffee table), which contains 100 colour photographs of tattoos inspired by or taken directly from the writings and characters of famous authors. The book was compiled and created by Eva Talmadge and Justin Taylor. Sound interesting? Well if it does, head over to the book’s website where you can watch a three minute and forty-seven second trailer about the book. When did books start having trailers? And trailers over three minutes long, at that? Anyway, I should also mention that if you live in New York or have plans to be there on October 20th, you’re more than welcome to head over to the book’s launch party at the powerHouse Arena. I feel like since this post is about things of a literary nature that I should sign off with some sort of clever, literary type quote. But I won’t, so there.